Halve fennel, remove stalk, and cut into fine strips. Finely dice onion. Peel garlic. Clean zucchini and bell pepper and cut into bite-sized pieces. Combine vegetables with rosemary, thyme, and some of the olive oil in a plastic bag. Close, shake, and marinate for approx. 20 min. 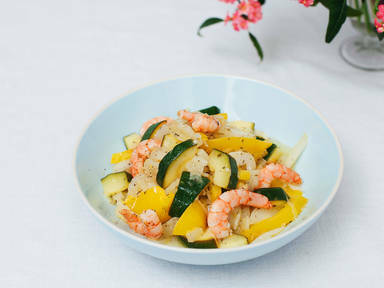 Combine shrimp with fish spice and remaining olive oil in another sealable plastic bag, shake, and marinate for approx. 20 min. In the meantime, combine herb vinegar, lemon juice and zest, Dijon mustard, lemon oil, salt, and pepper for the vinaigrette. Sauté vegetables in their marinade for approx. 5 min. Add shrimp and sauté for approx. 3 min. more, or until cooked through. Turn down heat and deglaze with prepared vinaigrette. Toss to combine. Enjoy!